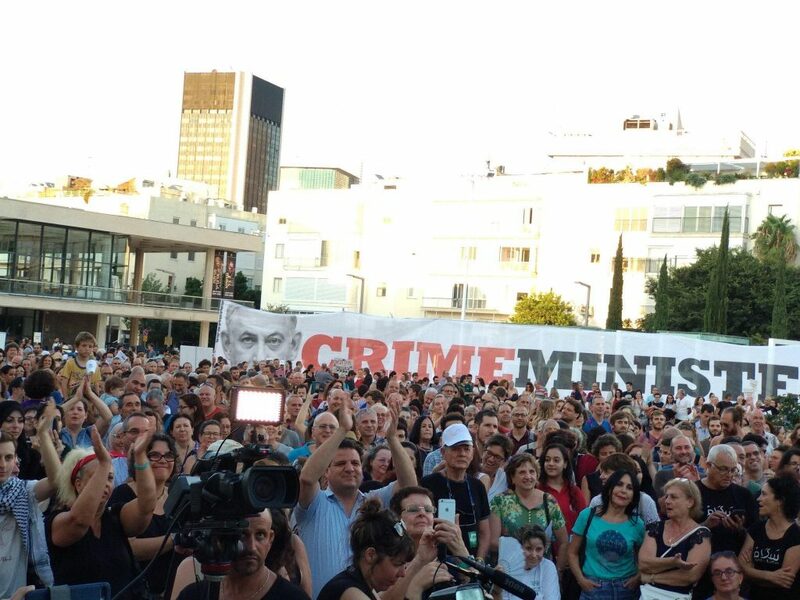 Overnight on July 18-19 the Israeli Knesset passed, by a vote of 62-55, a new “Basic Law on Israel as the Nation State of the Jewish People.” It created outrage among Arab and Druze citizens who see it as writing their second-class citizenship into law. It encourages the growth of illegal settlements on the West Bank and the continued dispossession of Palestinians. The Right proposed this law in August, 2011, at the time of the Arab Spring-inspired occupation of Rothschild Boulevard in Tel Aviv. Thousands gathered, as in Occupy Wall Street, to challenge the government’s economic policies. They began to raise further issues of social justice, even beginning—just beginning—to reach out to Palestinians, which terrified the power structure. The law aims to redefine the State along ever more reactionary lines. Benjamin Netanyahu’s government has trafficked in reaction with or without legal cover, with its attacks on the Left, immigrants, and Palestinians. The passage of the law was met with cries of “Apartheid!” by Arab List Knesset members like Ayman Odeh. This is a reality. But it is also too simple. The truth is that we are seeing one aspect of a very new worldwide form of reaction. This is not a measure that grows out of Jewish history. Rather, it is one more aspect of the cultivation of reactionary religion by state powers, as in today’s Catholic Poland and Hungary; in Erdogan’s Turkey, in Iran, in Saudi Arabia; in Modi’s Hindutva India; and in Putin’s Orthodox Russia. We see Trump appoint himself the guardian of Jerusalem, and cultivate the Saudi monarchy. We see Putin pull the strings of the Russian Orthodox Church, as his bought “scholars” in Ichkeria redefine Islam for his use. We see the Catholic Right attempt to reassert control of the Vatican. The potential for social disaster in this weaponizing of religion is apocalyptic. We have seen the horrors of ISIS already. Yet the closest that outfit ever got to controlling a symbolic religious center was its brief occupation of Dabiq. State-sponsored religious bigotry aims at merciless conflict. It moves the tripwire for war from territorial boundaries to the depths of human consciousness. In Gaza, in particular, the Israeli state has treated the lives of Palestinians as worthless—witness the mass murders during the recent March of Return, the brutal bombing of civilian areas, and the inhuman occupation. With Iran’s genocidal occupation of Syria, the threat of war with Israel—which also occupies Syrian territory—is a real possibility. Israel has bombed Iranian forces many times, and Iran has launched a few missiles in return. It is correct to call out the apartheid-like aspect of the Nation State Law, but equally important not to miss what is new. This entry was posted in Articles and tagged Arab List Knesset, Arab spring, Arab-Israeli conflict, Ayman Odeh, Gerry Emmett, Israel, Israel’s Prime Minister Benjamin Netanyahu, Israeli Knesset, Jewish people, occupation of Rothschild Boulevard in Tel Aviv, Palestine, Palestinians, Prime Minister Viktor Orban, reactionary religion, West Bank, World in View. Bookmark the permalink. News & Letters not only is a rare medium that reports on this but it shows US complicity in the attempt by the right wing in Israel to impose total apartheid on the country. Equally important (1) women are in the forefront of the protests; (2) MASSIVE protests come from BOTH Arab and Jewish Israelis.